There have been two reported court cases concerning a decision by the National Executive Council to award a K2.2 million contract to supply defence uniforms to an Australian company, Australian Defence Apparel Pty Limited, ahead of a lower bid from a national company, Robmos Limited. In the first case, the court found the first, second and third defendants (Fredrick M. Punangi – Secretary, Department of Defence, Michael Thomas Somare – Former Prime Minister, and the Independent State of Papua New Guinea), did not comply with the proper processes under the Public Finance Management Act. It was found that the defendants did not comply with the proper tender processes and acted improperly. In the second case, the court awarded damages of a little over K1 million to Robmos Limited. Robmos Limited is a national company which is 100 percent Papua New Guinean owned and has previously tendered for and awarded contracts to supply goods and materials to the Papua New Guinea Defence Force (PNGDF). Timothy James Ward Jnr is the director and major shareholder of Robmos Ltd.
Robmos was contacted by the Director of Supplies for the Defence Force on 8th April, 2005 and requested to provide a quotation to the PNGDF for the supply of ceremonial uniforms and accessories to be used during the 30th Independence anniversary celebrations. On 21st April, 2005, Robmos submitted a quotation of K1,766,250.00. Three other companies also submitted quotations. They were International Exports Limited of Cairns, Australia; Australian Defence Apparels Limited of Coburg, Australia and Combat Clothing Limited of South Port, Australia. Robmos was the only national tenderer from Papua New Guinea. Australian Defence Apparel is an Australian company operating internationally since 1987 and specialising in supplying uniforms and equipment for healthcare industries as well as emergency services, utilities and armed services. On 22nd July, 2005, the National Executive Council (NEC) awarded the contract to Australian Defence Apparels Limited for K2,217,833.19. This purchase was approved on the 18th of August, 2005, by the Secretary of Finance, who at the time was Thaddeus Kambanei (Kambanei later met digrace, when the Commission of Inquiry into the Department of Finance claimed he ‘abused his position as Secretary for Finance to access funds illegally from monies legally set aside for other purposes’). 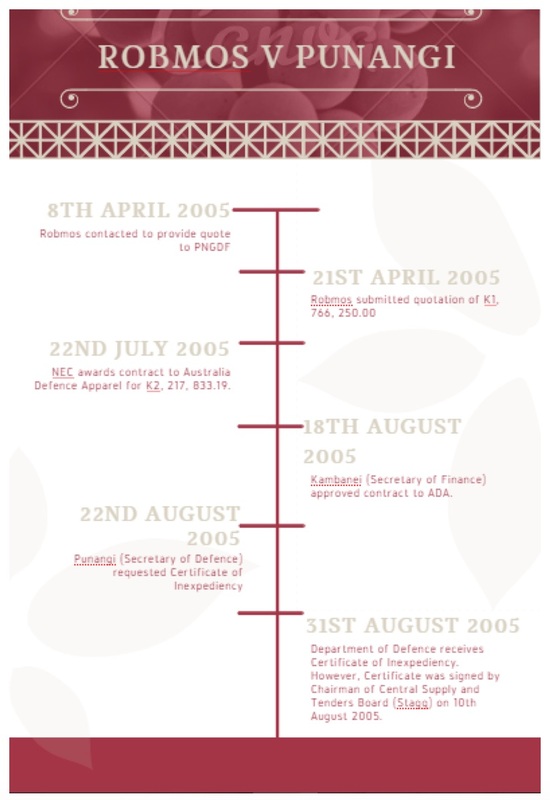 The Secretary of Defence (Punangi) then requested a Certificate of Inexpediency through the Central Supply and Tenders Board on the 22nd August, 2005, which was received on the 23rd August, 2005. A Certificate of Inexpediency refers to a practical and quick procurement process which may only be undertaken in the event of a: natural disaster, defence emergency and health emergency or a situation of civil unrest. However, according to the PFMA, under section 12 (B), “A ‘Certificate of Inexpediency’ cannot be issues to retrospectively cover a contract already executed”. The Chairman of the Central Supply and Tenders Board (Mr Philip Stagg) signed approval dated 10th August, 2005, before the official request had been made, and issued a Certificate of Inexpediency which approved the committed amount for the purchase of the uniforms and accessories from Australian Defence Apparels Pty Ltd (Stagg would go on to court controversy as Chanellor of Unitech, he was viewed as a central player in the failed removal of Vice-Chancellor Albert Schram). The Department of Defence received this letter on the 31st August, 2005. The Judge had declared that “it was purposely pre-dated, to 10th August 2005, to mislead those who will be affected by that decision”. The decision of the Secretary of the Department of Defence to provide authority to pre-commit a closed tender to Australian Defence Apparels Limited (ADA). The decision of the Secretary for the Department of Treasury (Finance) to fund the procurement of ceremonial uniforms from Australian Defence Apparels Limited for the PNGDF for the sum of K2,217,833.19. As of 14th May 2008, the plaintiff, raised the following issues for judicial review. Whether the National Executive Council acted beyond their own legal authority on the 22nd July, 2005 when reaching its decision. Whether the Central Supply and Tenders Board is bound by the provisions of the Public Finance (Management) Act 1995 and the Financial Instructions in its procedures and decisions in the awarding of tenders. Whether the Secretary for the Department of Defence’s actions in providing the authority to pre-commit funds for a closed tender to a non-national tenderer has authorized a breach of the Public Finance Management Act of 1995 (PFMA). Whether Prohibition should go towards forbidding the Central Supply and Tenders Board from awarding or approving tenders to a non-national tenderer. The relevant legislation in this case was the PFMA which was not adhered to by the defendants. Together with the PFMA are the Financial Instructions which must all be considered and read together. 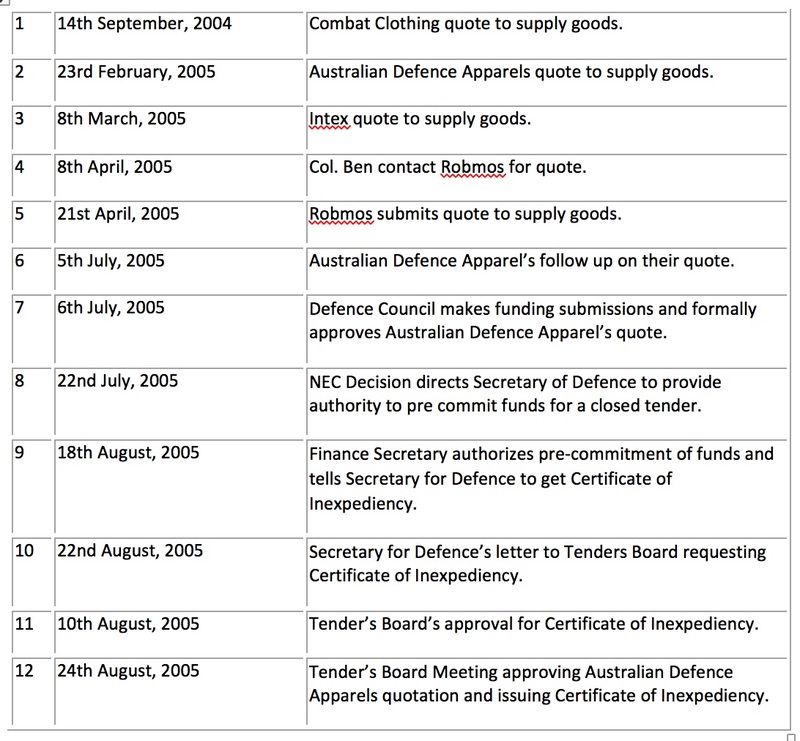 The initial documents outlining the Department of Defence’s request for funding for the military uniforms and accessories were signed by the Minister of Defence on 6th July, 2005. This document emphasised the importance of immediate delivery of the uniforms and accessories within 10 – 12 weeks. Thus, due to the urgency of the delivery, a Certificate of Inexpediency was obtained from the Central Supply and Tenders Board. The state argues that the national tenderer would have been unable to complete the delivery within the needed period and thus opted for the non-national tenderer. The PFMA (see Section 39 (4)) dictates that preference must be given to national tenderers. Furthermore, in relation to a national tenderer which is wholly owned or controlled by citizens, a reduction of 15 percent is to be made to the prices quoted (see Section 41 (6.2) of PFMA). However, according to the National Court proper tender processes were not followed. It was a clear breach of PFMA when the Certificate of Inexpediency was purposely pre-dated for the approval of the tender. Yet, the NEC proceeded with the submissions. Thus, the NEC’s actions far exceeded its powers laid down in the PFMA in that the NEC did not have the authority to award a closed tender, nor did it have the authority to pre-commit funds. It acted beyond the legal authority when it made the decision of 22nd July, 2005. As stated by the National Court, “the PFMA des not provide for consideration of tenders by the NEC. Tenders are to be considered by a Tenders Board only”. Issue no. 2: Whether the Central Supply and Tenders Board is bound by the provisions of the Public Finance (Management) Act 1995 and the Financial Instructions in its procedures and decisions in the awarding of tenders. Issue No. 3: Whether the Secretary for the Department of Defence’s actions in providing the authority to pre-commit funds for a closed tender to a non-national tenderer has authorized a breach of the PFMA. According to the PFMA and Financial Instructions, national tenderers are to be given priority and preference. It also makes clear that Certificates of Inexpediency cannot be requested after a contract has been awarded. Below is a chronological list of the events surrounding the case. As can be seen in the chronology, the Certificate of Inexpediency was purposely misleadingly dated, so it appeared to be issued before the Finance Secretary pre-committed funds in violation of the processes set out in the PFMA. The NEC did not have the power to approve the quotation without first obtaining the Certificate of Inexpediency. The evidence clearly portrays that the Department of Defence, NEC, and Finance Department did not follow process in relation to its request for the Certificate of Inexpediency. Furthermore, the Court concluded ‘No doubt, the Central Supply and Tenders Board has not complied with process’. After examining the evidence laid out, the first, second and third defendants (Fredrick M. Punangi – Secretary, Department of Defence, Michael Thomas Somare – Former Prime Minister, and the Independent State of Papua New Guinea), did not comply with the proper processes under the PFMA. Instead, the processes were short circuited for the benefit of the first defendant and the Department of Defence. Furthermore, the PFMA and Financial Instructions have clear guidelines and procedures on the giving of preference to National Tenderers, which was not complied with. Furthermore, in this case, the authority to pre-commit funds for a closed tender to a Non-National Tenderer was done without complying with process and before the Certificate of Inexpediency was issued. The plaintiff should have been given fair treatment by the Defence Council, the NEC and the Central Supply and Tenders Board. It has been found that the defendants have not complied with the proper tender processes and have acted improperly. Robmos Limited is a Papua New Guinean company suing for damages for the expectation of net income loss for a tender it should have won but didn’t due to the negligence or deliberate illegal and improper actions of certain servants of the State. Through a judicial review proceeding, Robmos was able to secure a decision nullifying an award of the tender to an Australia company which bided at a higher price than Robmos. Given that decision, Robmos argues that, liability has been established against the State. Consequently, Robmos argues for an award of the damages it is claiming. Whether the decision in the judicial review proceeding quashing the award of the tender to the Australian company has the effect of resolving the issue of liability against the Defendants in this case? If the answer to the first question is “yes”, is Robmos entitled to recover the expected tender value of K1, 766, 250.00? In April, 2005, Robmos submitted a formal tender to the Director of Supply of the PNGDF. The purpose of the tender was to provide ceremonial uniforms and accessories and to deliver these goods within 8 to 12 weeks to the order of Murray Barracks Stores for a price of K1,766,250 inclusive of all charges for freight and all government taxes and duties. However, despite being the only national tenderer, Robmos was not chosen. Instead, the state chose to award the tender to a non-national tenderer called Australian Defence Apparels Limited. the Third Defendant is bound by the Public Finance (Management) Act. The Court also held that Robmos was at liberty to file a claim for damages against the First, Second and Third Defendants in separate proceedings. Robmos argued that the National Court has already found out that the Defendants have breached their statutory duty to properly apply the Public Finance (Management) Act 1995 and Financial Instructions and in so doing they acted beyond their powers. That resulted in the Defendants failing to properly award the tender to Robmos. Consequently, Robmos suffered loss and damage in not being awarded the contract. Hence “it is entitled to bring a claim for damages arising out of the breach of statutory duty that were vested in the Defendants”. Although the Defendants have filed and served a defence, they failed to take any meaningful step to defend this claim despite the court’s given time allowance. The National Court has ruled in favour of Robmos and has supported the claim of negligence. It is argued that “the Defendants had a clear duty of care to the tenderers, including Robmos, to properly administer the tender process in accordance with the Public Finance (Management) Act 1995”. The Defendants breached this duty when they have failed to award the tender to Robmos, which was the only PNG national company meeting all the requirements and also quoted a lower price. The National Court argues this “represents what has become a bad and corrupt practice or attitude in the Central Supply and Tenders Board and others who are tasked to and or otherwise award contracts for supply of goods and services to the State”. Issue 2 – Is Robmos entitled to recover its expectation loss of profit by way of damages? The Affidavit of Tim Ward (director of Robmos), sworn and filed on 31st January 2014, contains and sets out Robmos’ evidence of its damages. This evidence includes calculations made by accountant Zanie Theron of Deloitte dated 3rd June 2011. The evidence being presented emphasises the claim in damages is a result of a loss of profit from not being awarded the tender. The evidence provided relies on both actual and oral evidence covering both prior profit and prior loss. A notable decrease in net profit since 2005 can be attributed directly to the breaching of the tender. The loss of the contract price is equal to the loss of Robmos’ net profit, which stands at K1,065,161.80. 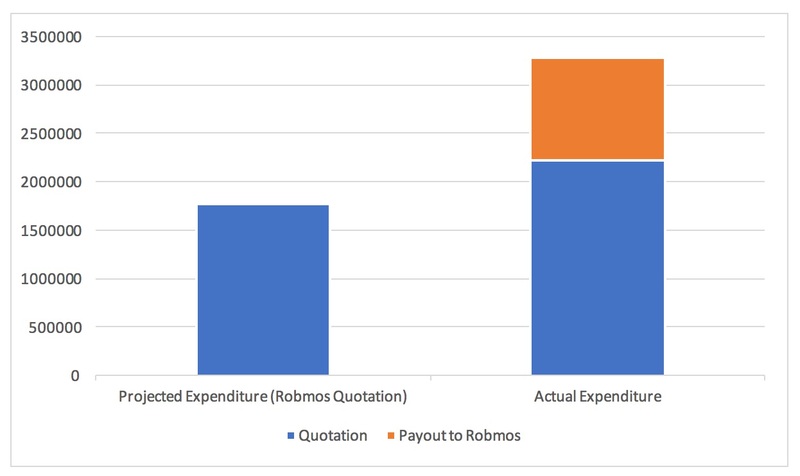 The graph below provides a comparative analysis of the difference in payments between the original quotation by Robmos Limited and the actual costs made to Australia Defence Apparel, plus the damages paid to Robmos. This graph does not include the interest payable on the damages payout to Robmos Limited. This evidence has gone uncontested as there is no argument or evidence from any of the defendants. Since these claims have gone uncontested, despite the numerous opportunities made by the court, the damages for Robmos have been awarded to the sum of K1,065,161.80. Furthermore, there will be a penalty of additional interest at two percent (2%) from the date of the issue of the writ until full and complete satisfaction of the judgement. (3) The Plaintiff’s costs shall be taxed if not agreed. 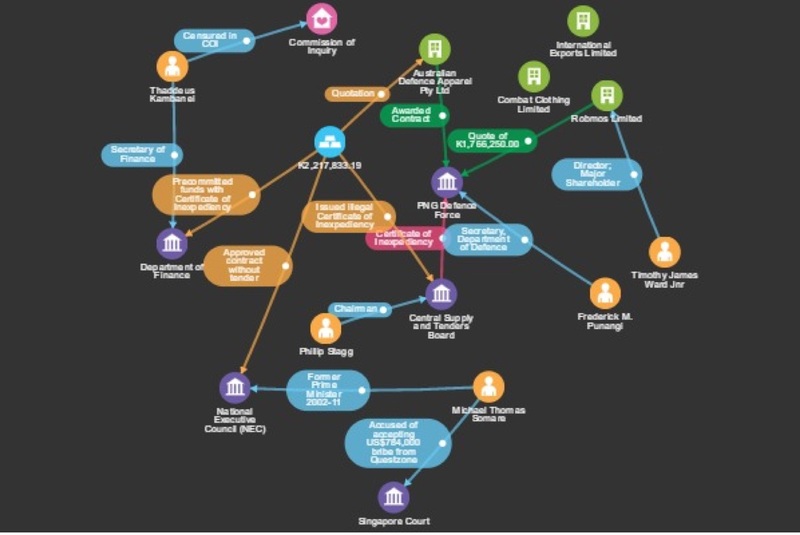 (4) Interests shall be calculated at 2% pursuant to the Judicial Proceedings (Interest on Debts and Damages) Act 2015, from the date of the issue of the writ until full satisfaction of the judgment. (5) The First, Second and Third Defendants are primarily liable to meet the judgment severally and jointly. (6) Unless the Fourth Defendant (the State) is able to ensure and see to the First to the Third Defendants fully meet the judgment, it shall fully meet the judgment and be at liberty to recover from the First to the Third Defendants.